My Malcolm is a temperamental boy, and I’m not always the most patient mother. When we try to work together on a school project, it doesn’t always end well. But when we cook together, we make quite a team. Over the summer, Malcolm invented a sauce with roasted red peppers, roasted beets and roasted tomatoes. He smelled every spice in the cabinet, choosing the perfect mix for his sauce. It turned out delicious! Smoky, spicy, slightly sweet. He named it “Malcolm’s supreme spicy sauce.” This weekend, he had the idea of turning the sauce into cookies. I suggested we make croquettes, using his signature spice mix, and we added some pureed moong dal. The result was something between a croquette and a cookie, like nothing I’ve ever tasted. But it was a wonderfully tasty dinner! We dipped it in a tart-sweet tamarind sauce, and ate it alongside cauliflower puree and spinach sauteed with garlic and mixed with goat cheese, tomatoes and pesto. And a salad of course! Malcolm ate 4 croquettes, and Isaac tried it, and ran crying from the table, saying, “I tried it and I liked it, but I want something I knew I liked, like pasta or rice!” Ah, yoots. Hotter than a pepper-crusted Samosa. I want a pepper-crusted samosa!! 1. Over medium heat, fry the shallot and then the garlic until they begin to brown, toss in the bay leaves and marjoram, to coat in oil. 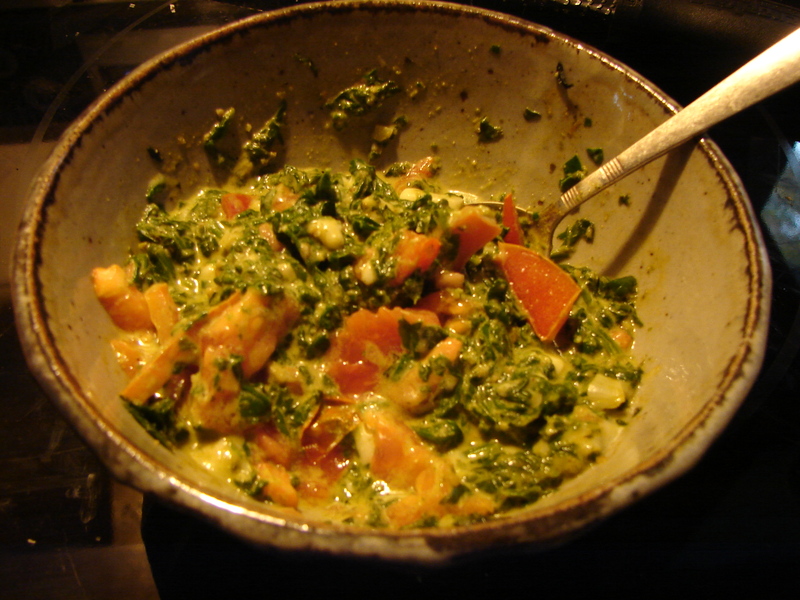 Add the moong dal (picked through, rinsed, and drained). Stir to coat in oil. 2. Add a cup of water, bring to a boil, lower the heat and cook, stirring frequently, until the water is absorbed and the lentils are soft, but still have a bit of texture. Turn off the heat, cover, and let them sit for a few minutes. 3. 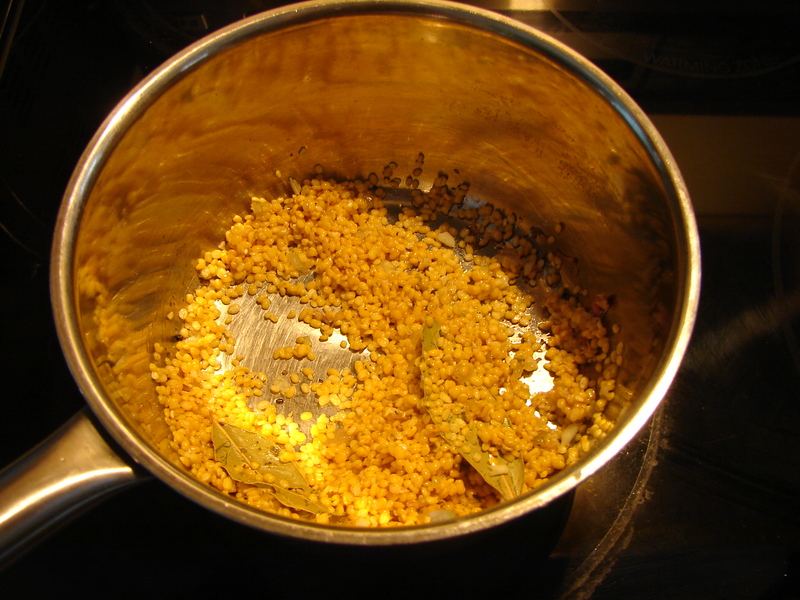 Put the cooked lentils in a blender and grind them into a rough paste. Add the other ingredients a blend until you have a batter about the consistency of whipped cream, but lumpier. It doesn’t need to be completely smooth. If you need to add more beer to process everything and achieve the correct consistency, by all means, do. 4. Coat a baking sheet lightly with olive oil, and preheat the oven to 425. Drop the batter by heaping tablespoonfuls onto the sheet, spreading them out a bit, and leaving an inch or two between them. Cook for about twenty minutes, until they’re brown on top. 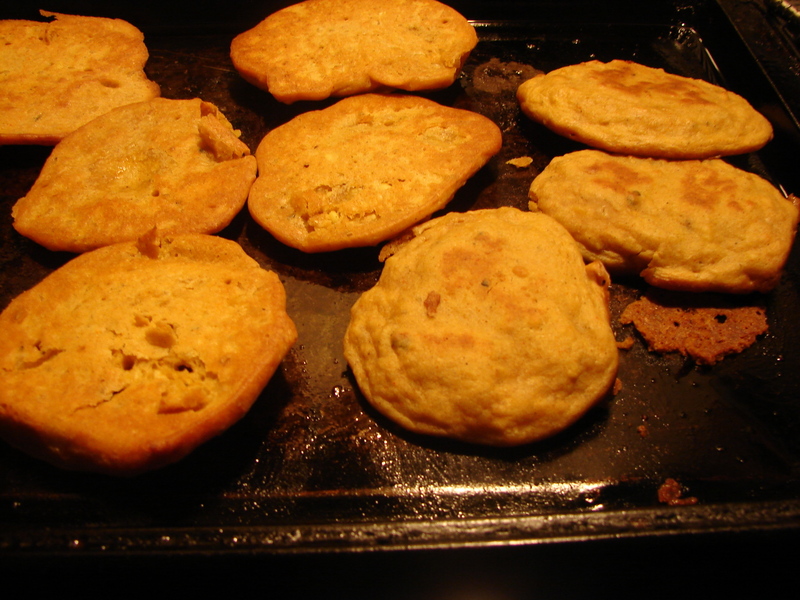 3/4 of the way through, flip them over, so both sides get nicely brown and slightly crunchy. I’ve been craving cauliflower puree, for some reason. 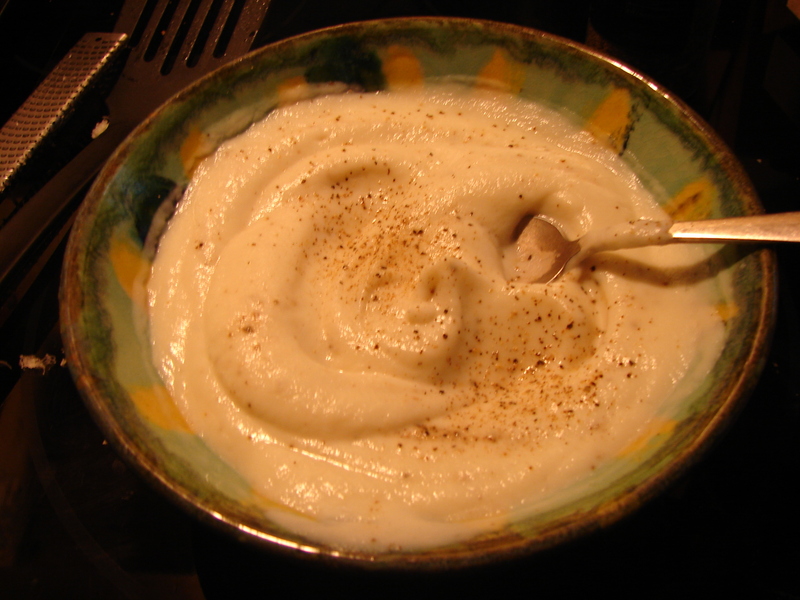 It’s so simple and comforting, like mashed potatoes, almost, but it has such a haunting cauliflower flavor, and such a silky consistency… I boiled the caulifower (roughly chopped florets) until it was soft but not smooshy, and blended it with a little milk and butter until it was silky. Seasoned with salt and pepper. Simple!! 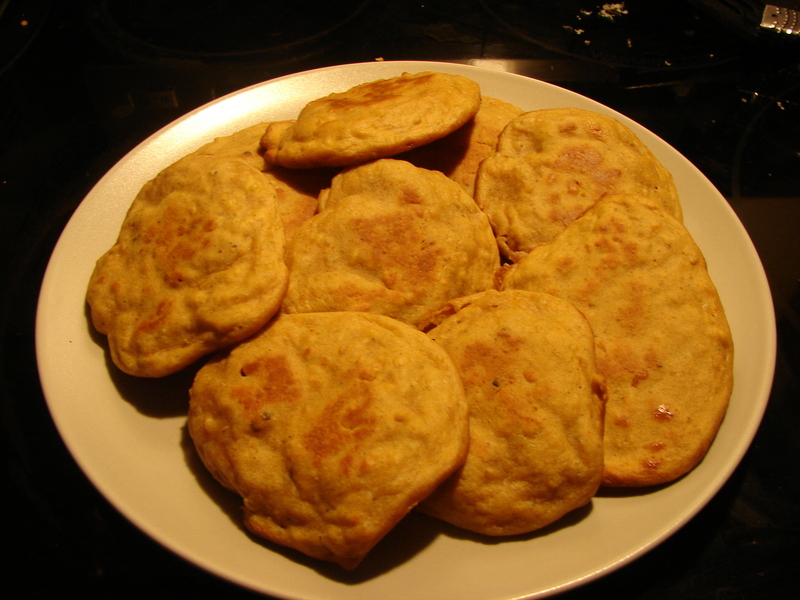 This entry was posted in cookie, lentil, recipe and tagged cauliflower, cooking with kids, green peppercorns, k'naan, moon dal, paprika, spicy croquettes by Claire. Bookmark the permalink. I’ve ordered these to cheer me up during my homeless period – when I’ll be between houses and staying with my Oxford daughter who’s a great cook! I’ll send Malcolm over to supervise! Oh – is she vegan, because these would work well without the egg, too, I think. No – that’s my Milton Keynes daughter. Malcolm would be most welcome! 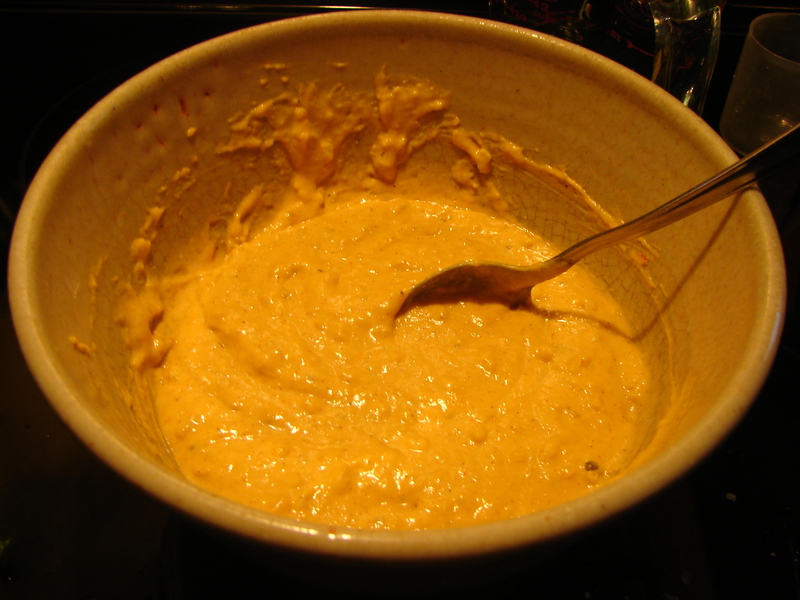 I have thrown a few diced yukon gold potatoes in with the cauliflower while it was cooking and then pureed it in the processor with milk and butter and kids like it – they think it is mashed potato.